I am proud to say that Latin Percussion has a long history as a company that produces high quality products. The Montvale Rhumba, LP's first recording in over twenty years, will surely be revered as a classic addition to LP's already strong collection of musical recordings. To commemorate the milestone release of the Montvale Rhumba the popular New York City night club El Flamingo hosted a record release party. For this evening of terrific music the Montvale Rhumba ensemble consisted of percussionists Little Johnny Rivero, Pedro "Pedrito" Martinez and Tony Rosa all of whom played LP Galaxy Fiberglass Congas and LP Valje Armando Peraza Series Wood Bongos, percussionist Tony Escapa who played LP’s New Bronze Shell Tito Puente Tribute Timbales, auxiliary percussionist/vocalist Ricky Salas who played LP Mambo Cowbell and LP Super Guiro, bassist John Benitez, harpist Edmar Castañeda, vocalist Johanna Castañeda, and violinist Alfredo De La Fé. 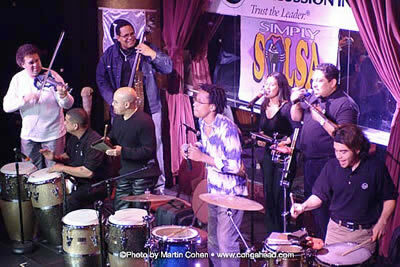 Throughout the evening many guest musicians played with the band including Eric Velez, Jose Jusino, Orlando Vega, Roman Diaz, Ralph Irizarry, Orlando Watusi, Samuel Torres, Edwin Sanchez, Dave Fernandez, and Ernesto Simpson among others. Listen to sound samples of the event.